iPhone, move over. Meet the Nokia N95. With less than a week from the official start of the iPhone selling season, I say pshaw. Last night at my Aunt Dana’s birthday bbq, while talking to Greg Carpenter from Boopsie Mobile Find, I got to hold, view, and take photos with his new Nokia N95. A very sweet little machine. About the size of the N80 but with more screen (rather like an infinity pool), a 5 megapixel camera (!!!! ), an interface similar to the N80 but more refined, and a second slider for Multimedia play functions. Did I mention the 5 megapixel camera? Since I last wrote about the iPhone, Apple has bumped up the on board camera from 1 megapixel (phhhbbbffftt…) to 2 megapixel (be still my non-beating heart). The iPhone requires a 2 year contract with AT&T / Cingular and there is no MMS (multimedia messaging) at all. Touchscreen interface sounds intriguing, but I had that with my previous PDAs. The only big news of the iPhone is the on board memory storage of 4 to 8 gigabytes, compared to the 2 gigs of the Nokia N95 (added miniSD card). 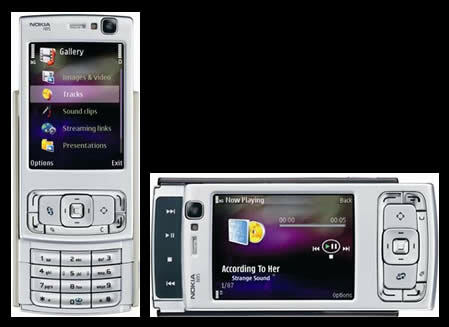 In Ms. Jen’s comparison of Tech Specs, Nokia n95 comes ahead by 9 features that the iPhone does not have, there were 12 draws, and iPhone has only 3 features that the Nokia n95 does not have. The big question I have for both devices is accessibility… can the font be bumped up? Will my Mom be able to increase the font size so that she could read the information on the screen without a great deal of frustration? Yes, Apple has the greater data storage, screen size and resolution, but their device has a camera that does not compete, no MMS (this knocks out cheap moblogging and photo sharing), unknown if the device can record video (play it yes, record it? ), and could it be a contender for moblogging? If Apple is not opening up the source code and is not allowing 3rd parties to develop apps for the device, how will folks send their photos to Flickr or Vox or use Shozu or any other beloved methods to send photos and text to the internet? With the recent firmware coma of my Nokia N80 and discovering that NokiaUSA will not help me flash a new OS to the phone, I *may* be on the market for a new phone. For as frustrated as I am with NokiaUSA right now (downright angry, in fact) and as much as I love Apple products and their customer service, I am not enticed by the iPhone. After last night, iDrool has been replaced with nDrool. by Ms. Jen on Sun June 24, 2007 | Permalink | moleskine to mobile, tech + web dev.